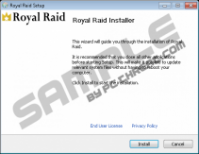 Royal Raid is a rather vague and questionable application that can affect your Mozilla Firefox and Internet Explorer browsers. As a matter of fact, we have found that this application has no real function whatsoever apart from displaying potentially unreliable third-party commercial advertisements. Due to the traits this application showed during our tests, we have categorized it as an adware program. This adware is very annoying with its constant flow of banners and pop-ups while you are surfing the web. But being annoying is only the smaller issue here; unfortunately, these advertisements can also pose a threat to your system security. Clicking on a corrupt ad could take you to malicious websites, which may have serious and unfortunate consequences for you and your computer as well. This adware may also spy on you and hijack otherwise legitimate advertisements. There is no doubt that you should remove Royal Raid if you want to use your computer safely. But, in fact, it will not even be enough since there may be several other infections on board as well since this adware never really travels alone. Please read our whole article to learn more about this useless application and how it may risk your virtual security. 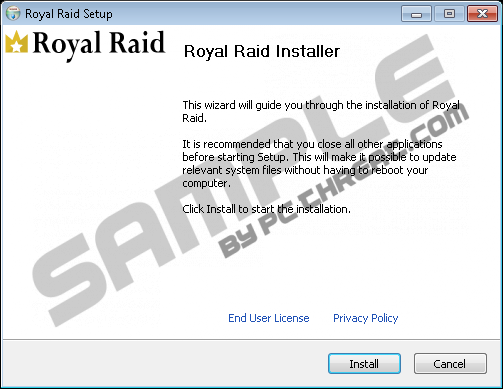 We have found the promotional webpage of this adware at royalraid.net. As a matter of fact, this page is rather simplistic with no actual information about this application and what it is supposed to do. “Join the royal family and experience the web as it should be seen” is all you can read on this page, which is rather vague to say the least and clearly shows that we are dealing with an application of questionable reliability. Another thing that you need to know about this official page is that you cannot actually download this program, but, instead, you can send the creators a message with your e-mail address and name. Giving this information to these schemers could result in targeted spam e-mails and other forms of unwanted promotional and potentially harmful content. Nevertheless, reports show that this adware is mostly spread in freeware bundles that may contain several other malware infections. Installing such a bundle could seriously endanger your computer and expose you to cyber criminals. Therefore, you should be very careful around suspicious-looking websites, namely websites associated with file sharing that host several potentially dangerous third-party advertisements. These ads can in some cases be quite misleading as they can be disguised as buttons, for example. If you click on such content, you may drop a package of malware threats onto your machine. If that has happened to you, it is important that you do not stop at deleting Royal Raid. Any potential threat left on your system may introduce you to malicious content that may lead to more infections and more system security issues. Royal Raid is not a new invention at all. As a matter of fact, we have realized that this adware is built on the infamous Injekt engine just like hundreds of other clones, including Triangle Trail, Bronze Aid, and Discovery App just to name a few. This adware has also been found being similar to that of SuperWeb family applications. The main purpose behind this worthless piece of software is for criminals to make easy money by tricking unsuspecting users. Revenue comes after the number of clicks on the advertisements this program displays on your screen. Therefore, this adware will try to show you as many ads as it can and also ones that may look very relevant to you. It is possible because this program can collect information about your browsing habits, search queries, and so on so that third parties can spam you with their customized offers and ads. This is exactly what cyber criminals like to take advantage of, too. That is why you need to think twice before clicking on an irresistible offer because criminals may trick you this way to redirect you to their dangerous websites. You should also know that if this adware is on your computer, it might mean that you are not safe to click on any advertisement as this program might hijack otherwise reputable and reliable advertisements. So it can happen that you are viewing a page, such as Amazon, and clicking on an ad on this page might take you to a malicious website. Unless you remove Royal Raid, you cannot be safe going online. We hope that you see now why we consider this adware a potential threat source on your system. At least by the end we can provide you some good news as well. In fact, it is quite easy to eliminate this adware since it has a working uninstaller. Running this uninstaller through Control Panel is all you need to do to cure this headache. Please follow our instructions below if you do not know how to uninstall an application. Also, make sure that all your software and drivers (Java, QuickTime, Flash) are regularly updated to secure your system. However, the best solution is always an automated one, i.e., to install a proper anti-malware application, such as SpyHunter. Press Win+X and pick Programs and Features. Quick & tested solution for Royal Raid removal.